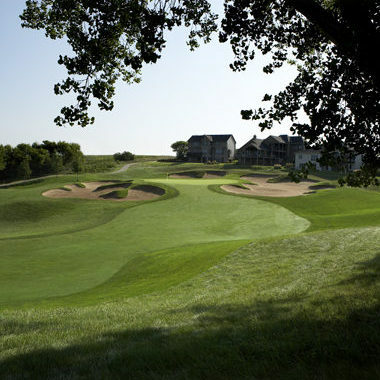 The Players Club in Omaha will host the 18th Nebraska Four-Ball Championship for the fourth time on April 27-28. The field size has been reduced back to 52 teams to help improve pace of play, and an individual Handicap Index limit of 9.0 will be implemented. The field once again filled on the first day of entries for this popular championship. Elkhorn's Alex Farrell and Chris Green are the defending champions, after winning in a playoff last year at TPC. First Round pairings are now available under the Pairings tab. Visit the Information tab for more on the championship. Entries are open to amateur golfers with an active USGA Handicap Index® based on ratings for men not exceeding 9.0 under the USGA Handicap System™ issued by a "member club" of the Nebraska Golf Association and a resident of Nebraska (see NGA residency below). Entry fee of $350 must be paid by every player. Entry fee will be refunded regardless of reason if the NGA is notified (402-505-4653) before the close of entries. After the close of entries, fee will be refunded in the event of injury or illness, if requested no later than April 26. No refund for any reason after April 26. A $50 service charge will be deducted from all refunds. Entries must be received by NGA no later than 5 p.m. C.D.T. on Friday, April 19, 2019. Late applications are not acceptable and will be automatically rejected. (Entries by telephone, e-mail, or FAX not acceptable.) Time limit for entries means time of receipt at NGA (not time entry is sent or transmitted to NGA). Entries should be submitted early to allow ample time for delay or error in transmission. The risk of delay or error in transmission lies solely with the entrant and the NGA will have no liability with respect to any such delay or error and the consequences therefrom, including rejection of the entry. Following the close of entries practice rounds will be available after 1:00 p.m. on Saturday, April 20 and Sunday, April 21 or at a time convenient to The Players Club on Monday, April 22 - Friday, April 26 at a rate of $50 (includes cart). If desired, those entered may contact the golf shop at (402) 963-9950 to make arrangements. The Championship will feature real-time scoring beginning Saturday, April 27. Pairings will be available here following the April 19 deadline. Lowest Score, Any Round: 61 (11-under), Dylan Heng, Bellevue and Lance Lawson, Norfolk, 2017 (Awarii Dunes GC); 62 (10-under), Justin Hamilton, Omaha and Kevin Stanek, Bellevue, 2008 (Willow Lakes GC); Knox Jones, Lincoln and John Sajevic, Fremont, 2009 (Willow Lakes GC); 63 (9-under), 3 times. Most Strokes Under Par, Any Round: 11-under (61), Dylan Heng, Bellevue and Lance Lawson, Norfolk, 2017 (Awarii Dunes GC); 10-under (62), Justin Hamilton, Omaha and Kevin Stanek, Bellevue, 2008 (Willow Lakes GC); Knox Jones, Lincoln and John Sajevic, Fremont, 2009 (Willow Lakes GC); 9-under (63), 3 times.